Well, day 10 of sugar detox is going surprisingly well. I am not crazy hungry, and no one has run away from home in fear of my mood swings. I am not going to use the “D” word, that begins with “DIE”. I prefer to call this new eating plan, downsizing. Mostly because I hope it results in downsizing my pants, shirts, dresses, etc. It is also a prettier word to describe something that isn’t always pretty or easy. I have lost significant amounts of weight in the past, and even managed to keep most of the pounds off. For me it requires constant vigilance, and that is the part that wears me down eventually. Before you start: See your doctor for a check up and tell them you are thinking about losing weight. Then talk to a dietitian and find out healthy ways to reach your goal. Set goals: Set a weight loss or health goal and figure out how you are going to acheive it. Do you have more success with a work-out partner? Do you need a weigh-in buddy to be accountable to or give moral support? I am a lone ranger for the most part, but do need a meal plan to give me specific examples of what I should eat. Keep positive: Don’t let negativity keep you from reaching your goal. If you have a bad day or week, move on and try to do better, allow yourself a do-over. Reward yourself with ‘non-food’ treats when you have success. Educate yourself : Read packages, you will be surprised at what is hiding in some of your favourite foods. 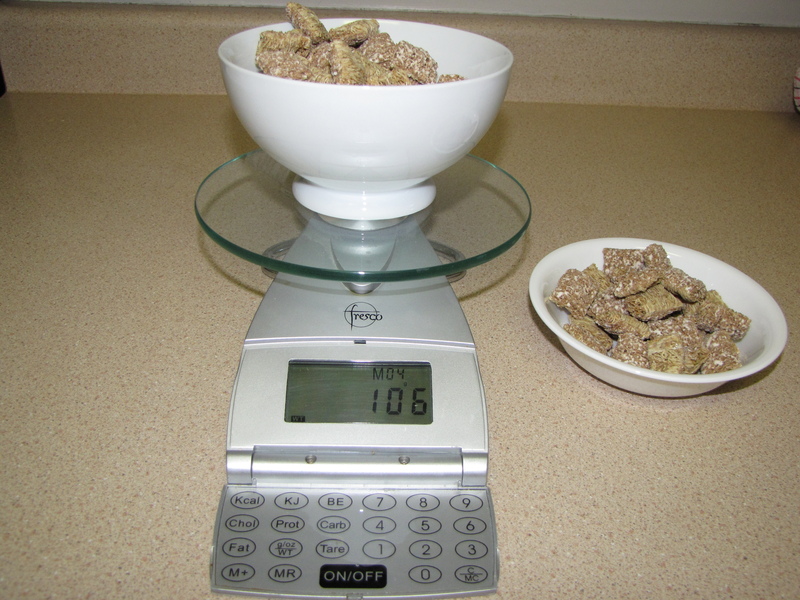 Learn about portion sizes, invest in a good food scale, measuring cups, and digital weight scale. I find that using a smaller plate, or bowl will help me keep portions in check too. 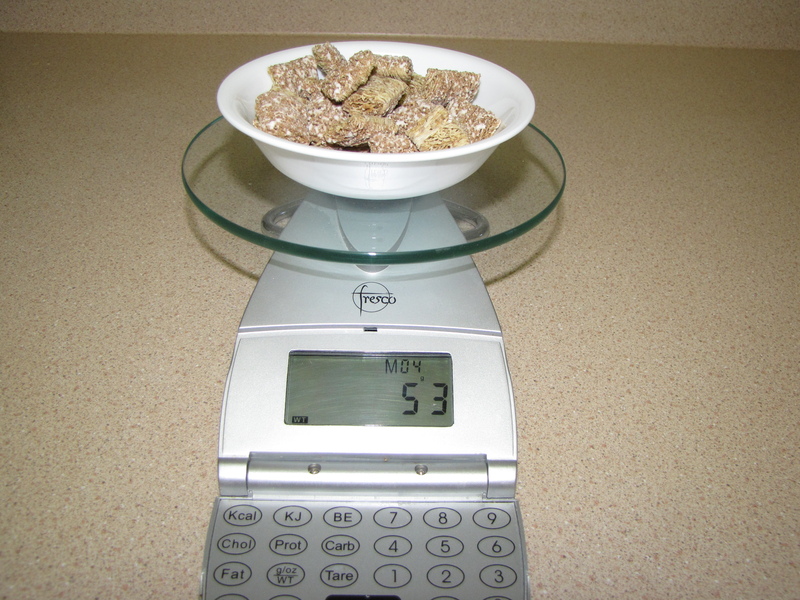 For example, I began to measure portions, and took note of just how much the serving sizes are for some of my favourite foods. They aren’t necessarily all junk foods, but things I eat everyday, and contain some sugar. I don’t eat a lot of take-out or junk food, ‘normal’ foods are making me fat because my servings are often super-sized! My morning cereal regime was double the suggested serving. More ideas? Some people find that counting calories and keeping a food journal helps them. I opted out of those routines. I have a meal chart from my dietitian that tells me how many starches, proteins, veg, and dairy I should be aiming for during the whole day. Last, but not least, get moving! I enjoy walking, but not much else when it comes to exercise. Find something that works for you and your schedule and stick to it. Consistency is important, it is hard to reach any goal without it. Whether it is working toward a promotion at work, or teaching your toddler to potty train. I am finding it difficult to fit some of my new goals into an already busy schedule. I find that I have to constantly give myself permission to ‘think of me’. Like a lot of people in a caregiver role, I sometimes feel guilty for putting my needs into the list of priorities. I realized that if I don’t take care of myself, I am an unhappy mommy who can’t keep up with her toddler. I’m sure you will get to hear a lot more about this new ‘sugar-free’ adventure! Posted in Blah Blah Blogs, Mind's Eye View and tagged accountable, acheive, busy, calories, check up, consistant, dietitian, doctor, downsizing, exercise, food, free, gain, goals, grams, guilt, happy, health, journal, loss, measuring, motherhood, move, ounces, partner, portions, positive, pounds, rewards, scales, servings, sugar, weight. Bookmark the permalink.